"2.62 Acres. Suburban Commercial & Residential Zoning "
ZONED SUBURBAN COMMERCIAL & 2 UNIT DWELLING! LOCATION! LOCATION! 2.62 ACRES! 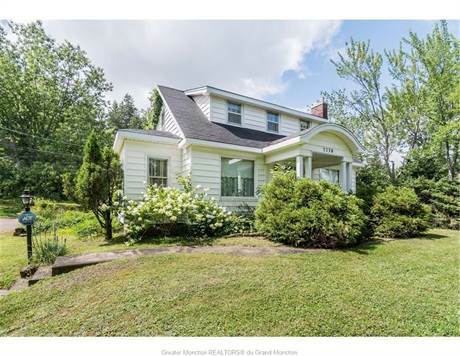 .. 2270 MOUNTAIN ROAD PRIME MONCTON NORTH ..... ATTENTION BUYERS THOSE LOOKING TO OPERATE A HOME OCCUPIED BUSINESS - INVESTORS & LAND DEVELOPERS! FANTASTIC LOT ! COUNTRY FEEL IN THE CITY ! 2.62 ACRES. 3 BEDROOMS - 2 BATHS - 2 STOREY - DETACHED GARAGE - CIRCULAR DRIVE. Main floor: Living room w Fireplace, Dining Room - Sitting Room - Reading Room Eat-in Kitchen, 3pc bath - walk in shower. Mudroom - Main floor laundry. UP: 3 bedrooms, 4pc bath, storage room. Basement , unfinished - storage. Home can be renovated. CLOSE TO CASINO, GOLF COURSES, TCH, MAGNETIC HILL, SHOPPING, CRANDALL UNIVERSITY & ALL MONCTON NORTH CONVENIENCES. EXCELLENT OPPORTUNITY! QUICK CLOSING AVAILABLE!